I have had the opportunity to work with some great kids in all of my classes — seriously, I get to teach Honors 10, Mass Media and also Yearbook??? — I know that I’m fortunate. I’ve had the chance to embrace teachable moments in all and have had the opportunity to guide many students in their study of what’s right and wrong in many instances. In many cases I’ve been challenged by their line of thinking and their reactions to events as they apply to a young person. It’s immensely rewarding. But one thing we don’t take for granted in the course is the importance of ethics. Past students who might be reading this know about the ethical scenarios and discussions about running pictures and article and picture placement and the gray areas. They learn about stakeholders and how something seemingly harmless can affect somebody so greatly. They learn about Stephen Glass and Jayson Blair and Rick Bragg and Janet Cooke and the mistakes they’ve made and the ultimate hope is that they learn from these mistakes, making sure to consider all the angles when out on their own. They learn the importance of getting it right first, not getting it first and maybe it’s right. And I want to make sure that this is very clear — there are still some very good journalists out there — the problem is this, they don’t get the credit enough and the screw ups take it away from them even more. And that’s something that has deteriorated in our world of media today. This idea — of getting it right at all costs first — just isn’t adhered to enough. (Sure there are some stalwarts out there, make no mistake about it). The media machine, which for quite some time now expanded to a 24 hour cycle, chews people up and spits them (and their ethics) out. In just the past couple months we have seen horrible events occur in our country — as well as horrendous mistakes in their coverage. I’m a twitter user and have used it for quite some time now, but it’s to the point that when something big is happening, the safest thing to do is to simply ignore it. The chance of getting something reliable through social media is next to zero. And that’s a shame. Picture people with ethics using this tool appropriately. I don’t mean just a few — I mean all journalists. I remember finding out that there had been a school shooting at Sandy Hook Elementary through Twitter and I remember watching as agencies rushed their news — some went so far as to publish a picture of the “identified” shooter — who just so happened not to be the shooter. Think about that — let it sink in. (Another one of the tenets of strong journalism is that the more controversial an issue is, the more sources you get to verify). Can you even imagine what the twitterverse would have been like had it existed on 9.11.01? My head was already dizzy that day just from watching the news on tv. I may have imploded — and I don’t say that to be funny. Frustration. That’s what I feel as I read people tell me not to decry the media for their faults in reporting things like this. It’s just too hard to get it right, they say. Nobody ever said the job is easy. Quit making excuses for the fact that this is difficult. Get it right — and watch your reputation continue to stay strong. Woodward and Bernstein didn’t look for easy — they pounded the pavement against incredible odds and got it right. Walter Cronkite is surely rolling over in his grave on days like this. Frustration. That’s what I felt yesterday as I learned that a suspect in the Boston Marathon Bombings had been caught and then later learned that this was not true. Quite frankly, it doesn’t surprise me that CNN reported this then “un” reported this. Their track record isn’t the greatest. And that’s being kind. So if you read that from the bottom up (as it happened), you’ll notice that for an hour they ran with this as being true. 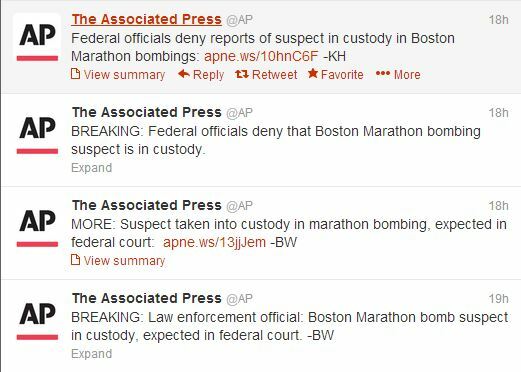 Do you realize just how many news outlets that subscribe to the AP ran with that during this time period? Incidentally, the idea of using the word breaking in this day and age of immediate news is almost comical. So now I can’t trust the AP, either. I’m going to tell you who I know I can trust, though — Adam Gretz and Danielle Waugh and Natalie Bruzda and Maggie Graham and Libby Cunningham and Pat McAteer — all former students who are now working in the field of media in one form or another. I know I can trust them because I KNOW that the concept of ethics was driven in to their heads — but more importantly, I know this because I know that it MATTERS to them. I just wish that there were more whom I know I can trust.